Easily convert your scanned images and drawings to a vector format with this simple conversion program. Raster to Vector supports bitmaps, tif, gif, png, tga, pcx, rle, j2k, jas and mng file formats among a couple of others. This tool also supports some added filters and effects such as outlining your solid raster areas, colour vectorization, scaling images, batch processing of vector images and full control over tolerance levels. 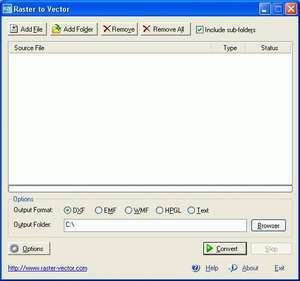 You can also use Raster to Vector for editing your imported files in any type of CAD application like AutoCAD. Version 9.6 is a freeware program which does not have restrictions and it's free so it doesn't cost anything. For security reasons, you should also check out the Raster to Vector download at LO4D.com which includes virus and malware tests. Additional screenshots of this application download may be available, too.